To take advantage of our exclusive bonus, simply open an account on anyoption.com by clicking on the link above. Our bonus offer will be automatically acquired. The AnyOption platform is a proprietary one developed solely and exclusively by the broker’s dedicated team. 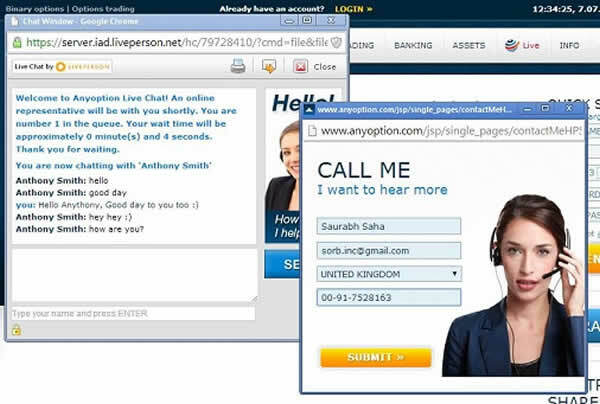 However, since it has been around since almost day one from the inception of binary options trading many other while label platform providers seem to have copied the features, layout and design of the Anyoption platform. Some argue that the extremely popular SpotOption platform bears many resemblances to the Anyoption platform, which can then rightly boast of setting the industry standard as regards their platform functionality. Fully localized in several languages, the Anyoption platform provides a trading environment that is characterised by user friendliness and simplicity, while also being intuitive, fast and reliable. Live quotes are provided by Thomson Reuters and this greatly facilitates the trading process. Anyoption have been accused of being too conservative as a broker and adopting a traditional modus operandi, without fancy bonuses and promotions. However, in the current market environment these core values can be argued to be more an asset than a liability, since this broker aims to keep things simple, easy, safe and legitimate and concentrate on what really matters rather than on useless frills. That being said, innovative features and tools are also present and this help to greatly enhance one’s trading experience. Moreover, responding to the needs of those traders who wish to conduct real time trading on the go, Anyoption has developed a fast and user friendly application that enables one click trading from any ios or android device, which can be downloaded for free from the App store and Google play. Through this application, the broker gives true substance to its slogan “anyoption.anywhere”. 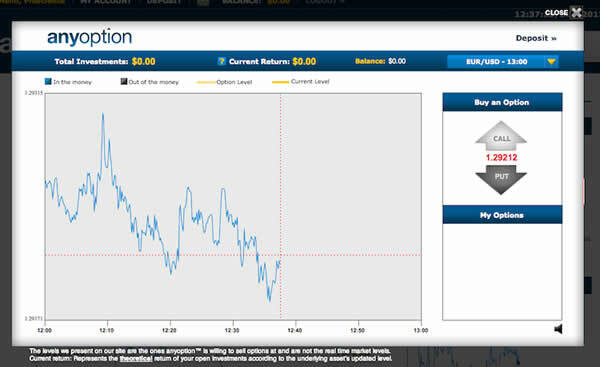 Besides the traditional call/put digital type of binary options trading type, the unique AnyOption platform gives traders the opportunity to trade in several other types of trading also offering an extensive choice of expiry times for most available tradable assets, ranging from 15 minutes to a couple of days. A feature that truly stands out is the fact that it is the only broker to offer a dedicated trading platform for bitcoin. 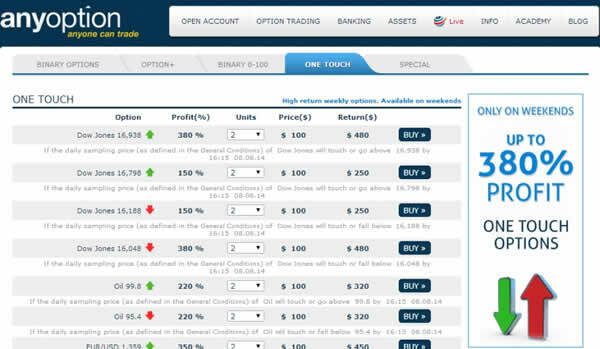 Moreover, by taking advantage of its innovative features, such as Take Profit, Roll Forward and Profit Line, Anyoption clients can greatly enhance their trading experience and maximize their chances to achieve profits. Option+ and Binary 0-100 are the main two other trading types available and they are both unique to Anyoption and enable clients to close their positions earlier, or engage in fast track trading, while the One Touch trading type opens up the possibility for much larger returns. 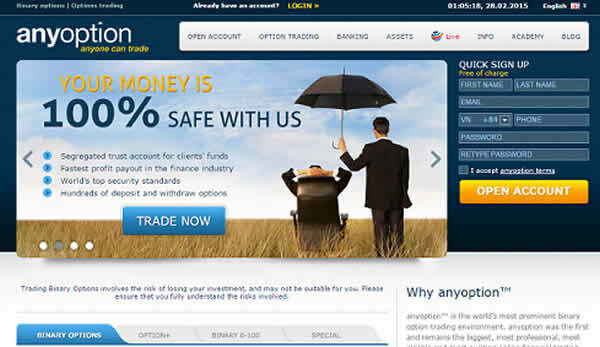 The tradable assets offered by Anyoption are another of its strongpoints. They are truly extensive, featuring nearly 100 different items across all the four different assets categories of forex currency pairs, stocks, indices and commodities. As already mentioned, Anyoption is also the sole platform to offer a dedicated Bitcoin platform, while it also gives clients the opportunity to trade on upcoming IPOs. More specifically, the tradable assets menu at Anyoption includes 4 commodities, 27 indices from the USA, Europe, the Asia Pacific region and the Middle East and 15 different currency pairs of which the AUD/USD, EUR/USD and USD/JPY are offered for trading on a 24 hour basis. Perhaps most impressive is the number of 60 whopping different stocks available, all from well known companies of which 27 are from the USA, 24 from Europe and 9 from the Asia Pacific. It should be noted that only some of the assets are available for trading in the Option+ and Binary 0-100 trading modes, with 17 different assets for the former and 9 different assets for the latter. Contrary to the usual practice of most brokers to be offering several account types for customers to choose from, Anyoption adopts a different stance on this matter and only has one account type available for its clients. In practice, this means that all traders, old and new, big or small (in terms of account balances and deposit amounts) gain access to all perks and tools available to account holders. This makes every customer feel equally important and ensures that they are all treated in the same manner, enjoying the same high level of service and customer service and support. As a result every account holder at Anyoption can truly become successful, flourish and excel. The minimum deposit requirement when depositing funds in your AnyOption account is 200 USD. Deposits as well as withdrawals can be conducted through all the major credit and debit cards such as Visa, Maestro and Mastercard. Moreover, banking may also be executed via electronic wire transfers as well as through Skrill (Moneybookers) with additional electronic methods available depending on the location of each customer. Deposits and withdrawals are easy and simple to carry out and withdrawals are usually processed without hassle within 3 working days from the relevant request. Furthermore there is a withdrawal reversal process in case a client wishes to cancel the request before it gets finalized. There is no minimal withdrawal amount, however, only one withdrawal per month is exempt from commission fees, while every additional withdrawal is charged a fee of 30 USD/25 EUR/20 GBP. Anyoption is a truly multilingual broker that makes it very easy for traders across the globe to conduct their trading in their own mother tongue. In fact the platform is available in a truly impressive number of different languages, including English, Turkish, Spanish, German, Russian, French, Chinese, Swedish and Dutch, while native speakers of all these languages are also available for assistance at the customer service department. Customer service is delivered in a dedicated, prompt and polite manner and it is available on a 24/5 basis, excluding weekends. Customers can contact the department if their query is not adequately addressed in the comprehensive FAQs section of the website either via live chat, through email or by phone. The primary support phone number provided is located in the UK, while there are also local phone numbers available in Cyprus, France, Germany, Italy and Spain. Moreover, an innovative and very useful feature is the fact that clients can put in a callback request and be promptly contacted by a suitable customer service agent. True to its profile of an extremely user-friendly broker, which is particularly accessible to inexperienced, novice traders, aiming in this way to justify its main brand slogan “anyone can trade”, Anyoption has compiled an extremely useful and informative trading academy which contains information in the form of videos, e-books and articles all aiming to teach and educate traders about all aspects of trading binary options, including topics such as risk, capital and portfolio management, trading strategies and fundamental and technical analysis. The valuable education gained is truly helpful in rendering even the most novice traders into potentially successful ones. AnyOption is undoubtedly one of the strongest and most robust brokers in the online retail binary options industry and it currently boasts a market share of over 20%. This broker has hundreds of thousands of active and loyal users and records several millions in revenues month after month. Further testament to its popularity and success, underpinned by its professionalism and reliability, is the fact that may soon be applying for an IPO at the London Stock Exchange. The different way it chose to conduct its business and the fact that it uses its own platform and it is thus more flexible and able to tailor each trade to the specific requirements of the asset being traded, helps it to stand out from the rest in this fiercely competitive industry and renders its truly effective and efficient. For all these reasons and many more it deserves a thumbs up and it is sure worth to try them out.